Barbecue sauce and grape jelly are the secret to making these meatballs moist and flavourful. Mix barbecue sauce and jelly in large skillet. Cook and stir on medium heat 2 min. or until jelly melts. Add meatballs to skillet; cook 10 min. or until heated through. 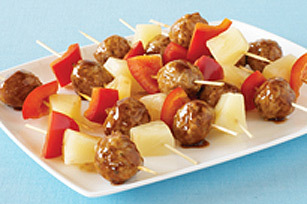 Skewer each meatball alternately on long wooden skewer or toothpick with pineapple chunk and red pepper. For variety, substitute seasonal fresh vegetables for the red pepper and fresh pineapple chunks for the canned pineapple.